Email marketing campaigns can be confusing and downright stressful. There are so many different kinds. You need subject lines that catch a reader’s attention. You need to push the reader to perform an action. As always, we’re here to help. Today we’re going to talk about email drip campaigns and the keys to having a successful one. First things first, an email drip campaign is what it probably sounds like to you. It’s a series of emails sent one after another in a predetermined schedule. An initial action (e.g. signing up for an email subscription) will get the drip started. The reader will get the first email. Then after a few days (or another action), the reader will get the second email. This goes on and will, with hope, end with your reader performing a certain action, such as downloading a whitepaper or making a purchase. 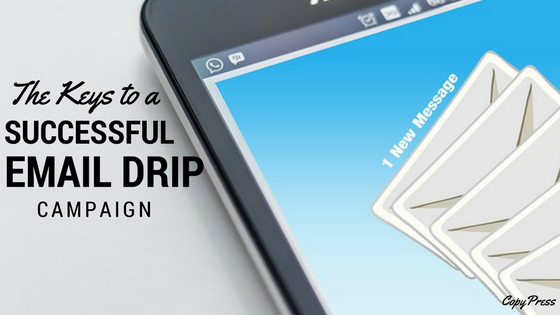 Now, without further ado, let’s look at the keys to a successful email drip campaign. As with most things, you need to have an end goal to set your sights on. Everything you do is going to be in service of reaching this goal. The goal will most likely be to get a reader to perform an action, just like we talked about in the intro. What do you want out of your reader? Do you want her to download content? Should she be making a purchase? Should she stay on your email list? Click through your site? Share your content? Make your goal measurable. That way you know if you’re actually achieving it. Your goal should also align with your business objectives. Your business should be getting something out of this, whether it’s keeping customers coming back, landing more sales, or getting your name out there. Your email content needs to be quality and purposeful. If you send email after email with content no one cares about or that’s poorly written, your readers are going to go straight for that “unsubscribe” button (as hard as you may try to bury it in the fine print). Similar to how you’ve set an overall goal for your campaign, you should give each email a purpose. A helpful way to do this, that we at CopyPress do ourselves, is to outline each email in each campaign. Defining the purpose of the email sets your writer (or you, if you’re the writer) up for success. For example, your first email could be a welcoming email that explains how things work, offers up a coupon, or gives a general description of what the reader can expect and where they can find more information. Your second email could outline a problem and show how your business brings a solution. Your third email could provide real world examples of businesses facing the issue you’re trying to solve or using the product you’re selling. Your fourth could be pushing to seal the deal. For each email, provide some sort of call to action that gets you toward your goal. Another part of your email to focus on is your subject line. You’ll be DOA if you don’t have a catchy enough subject to warrant an opening or if your subject reads as spammy. Now that you have your guiding light of a goal and your content written and ready, it’s time to get to work on the schedule. The schedule of a drip campaign is what makes a drip campaign just that. As much as we wish we could tell you that there’s a perfect formula for timing your emails, there just isn’t. However, a good rule-of-thumb to start with is to begin with higher frequency and then slow it down as time goes on. Because your system is most likely going to be automated, this is a pretty simple thing to do. You can move from once every three days, to once a week, to once a month, depending on the actions your reader is taking. Once a reader has taken the action you’ve wanted them to take, for example, downloading a whitepaper, you don’t want to continue sending emails asking them to download the whitepaper. Their download should trigger that campaign to stop, and should move them to another email campaign, perhaps for a similar product. If you find you’re having a hard time getting people to follow through, check the analytics on your email system. Try sending emails out on different days and at different times to see if that improves your open rates. People are different, and so different things draw in different people. You can use this to your advantage. Play with different subject lines. Play with different wording. Be straightforward and factual. Be fun and playful. Your outlines, purpose, and goal should remain in tact, but you can still play around with how you fill in the gaps. This improves your efficacy because you’re not using a one-size-fits-all solution. You’re tailoring content to different personalities. The best part about doing this is if you find one template isn’t working, you can try something else. Continue sending out emails, see what works and what doesn’t, make changes, and send them out again. Segmentation is an important part of this process. You don’t want to use one subject line on your entire email list. That won’t help you narrow down much. Email lists can be segmented in so many ways, from geography to gender to where someone is on your sales process. By segmenting your list, you can customize content for each segment, giving you more insight into what works for whom. Email drip campaigns are largely successful means of marketing. Many businesses use them, and you should consider using them, too. If writing these emails seems a little too daunting, CopyPress has skilled writers with experience in a variety of verticals. Ready to tackle it on your own? Follow these steps to get your campaign started today.